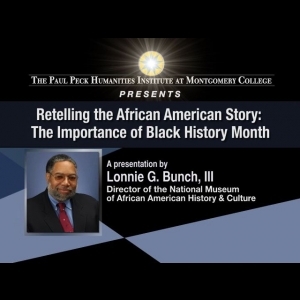 Montgomery College Television Arts & Humanities	 A keynote address by Lonnie G. Bunch, III, Director of the National Museum of African American History & Culture. Recorded Feb. 11, 2009 at the Smithsonian Faculty Fellows Presentation Event. A keynote address by Lonnie G. Bunch, III, Director of the National Museum of African American History & Culture. Recorded Feb. 11, 2009 at the Smithsonian Faculty Fellows Presentation Event. Embed "Retelling the African American Story: The Importance of Black History Month" on your page.